We acknowledge the central tenet of our faith, that the Holy Eucharist is truly the body of Our Lord Jesus Christ. 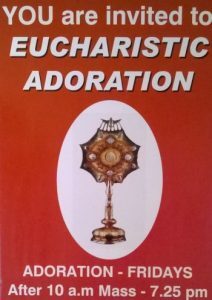 Eucharistic Adoration takes place on Fridays, commencing after 10.00am Mass and finishing shortly before 7.30pm Mass – apart from July and August when Adoration is suspended. We have a core of dedicated adorers who attend throughout the day to ensure continuity of attendance. This gives all parishioners an opportunity to come and spend some time in quiet contemplation, meditation or prayer whenever they have the opportunity. We extend an invitation to all parishioners, if passing, to come and spend some time with the Blessed Sacrament.